Wellers Hill Hardware and Landscape Supplies offers big brand products at competitive prices. Our local Tarragindi store offers a range of hardware and landscaping supplies Brisbane Southside, with the friendly customer service that you can only get from a locally owned store. We have an extensive range of landscaping supplies and a secondary holding yard to ensure that we can provide high quality supplies as quickly as possible. We stock everything from bedding sand and crusher dust to topsoil and sugar cane mulch. Don’t waste time wandering around a large hardware store trying to locate supplies. 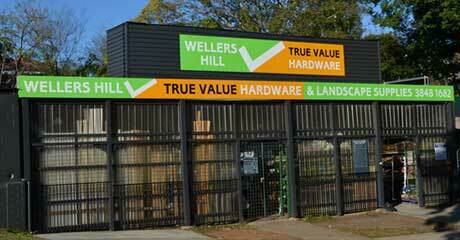 At Wellers Hill Hardware our team are more than happy to help our customers find what they need. Our local delivery service means that you can have your landscaping supplies picked and delivered to your doorstep. For big brands, competitive prices, and local customer service you can’t beat visit Wellers Hill Hardware and Landscape Supplies Brisbane Southside today. Or call 07 3848 1682 to organise delivery. The team at Wellers Hill Hardware and Landscaping have been serving Brisbane Southside for over 50years! The current owners and brothers Paul and Gerard have half a century of Building and Landscape Gardening experience between them. The hardware store stocks your general hardware, paint, timber and landscaping supplies. The site even boasts a drive-in landscape yard right in the heart of Brisbane Southside, Tarragindi. Our surrounding community and local tradies and landscape gardeners love the service they get and the prices are competitive and often even cheaper than the bigger guys.